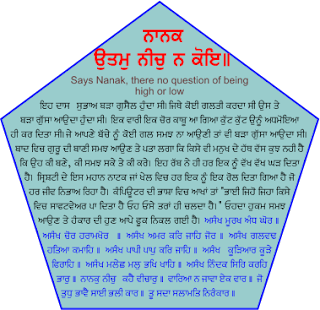 "Says Nanak, there no question of being high or low"
I used to be an angry man. Whenever I would find some body doing wrong thing I would get angry. Once we caught a thief and thrashed him to the extent that he became senseless. Whenever my own child would not understand some issue I would get angry at him. Later I happen to read Guru Nanak and there I got the idea that things are not quite in the control of an individual. Guru the teacher taught me that this life and universe is a drama enacted by Nirankar the Formless God. Every individual, every creature has been assigned a different role. So we act accordingly. There I realised my limits, what could I do if God had created my blind or lame or deaf? Simply it was not in my hand. Now my anger and ego has vanished to some extent. Now I no longer hate a thief, a stupid, a crook, a dishonest, a murderer. I feel pity for them. I feel thankful to God that he did not assign me a negative role. Since we are created by the same great Father we should love each other. I want to clarify here that the negative roles do get punishment also while the positive are honoured in society. Why I raise this issue is because once my relative who was doing a wrong thing and when I alerted him he raised the issue of 'Within His will" saying that God alone was getting the thing done by him. I then clarified that get ready for the punishment also. Countless Your fools, blinded by ignorance. Countless thieves and embezzlers. Countless impose their will by force. Countless cut-throats and ruthless killers. Countless sinners who keep on sinning. Countless liars, wandering lost in their lies. Countless wretches, eating filth as their ration. Countless slanderers, carrying the weight of their stupid mistakes on their heads. Nanak describes the state of the lowly. I cannot even once be a sacrifice to You. Whatever pleases You is the only good done, You, Eternal and Formless One. NB- PLEASE if u have any question raise it right here. We will be pleased to explain with what ever little wisdom we have.